Coverage: Live updates, video clips, medal table, results and news alerts, catch-up service, plus commentary on BBC Radio 5 live. Television coverage on Channel 4. Ireland competitors won four medals at the Paralympic Games in Rio on Wednesday to take their overall tally to seven. 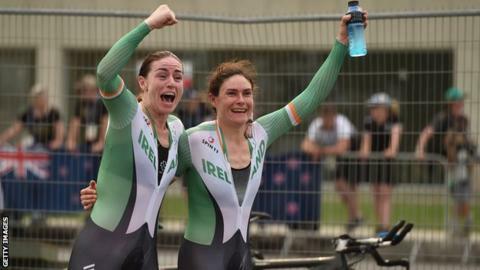 Cyclists Eve McCrystal and Katie-George Dunlevy struck gold in the Women's B Time Trial while Eoghan Clifford topped the podium in the Men's C3 Time Trial. Colin Lynch was a silver medallist in the men's C2 time trial. Ellen Keane then won bronze in the SB8 100m breaststroke final to complete a memorable day for the Irish team. The 21-year-old from Clontarf clocked 1:23.07 in a race won by Canada's Katarina Roxon in 1:19.44. For McCrystal and Dunlevy, their time of 38:59.22 left them 33 seconds clear of silver medallists Japan, a feat achieved in trying humid conditions. Clifford, 36, from Galway, collected his second medal of the Games, having already taken bronze in the C3 individual pursuit last Friday. Track and field athletes Jason Smyth and Michael McKillop have both won gold medals for Ireland in Rio. Canadian-born Lynch, 45, was in the leading trio throughout the 10K race and finished just over 19 second behind winner Canada's Tristen Chernove. Lynch, who has a Drogheda-born father, finished fifth in the individual pursuit event at London 2012. His decision to continue on to Rio was vindicated by Wednesday's achievement. Lynch, who lives nears Stockport in England after moving from Canada in 2005, broke his leg while playing rugby as a 16-year-old and it was at that point that a tumour was discovered on his spinal cord. Following complications, he had to have a below-the-knee amputation but Lynch didn't take up cycling until he was aged 37 in 2008. Lynch won his first world title in 2011 but despite achieving further medals at world championship level, he went into the Rio Games searching for his first Paralympic medal. Speaking from Pontal where the event was held, a beaming Lynch spoke of his delight at winning his first Paralympic medal. "It's four years and to achieve the one thing I didn't have, a Paralympic medal. It was really close and I was trying to figure out how to get everything out of myself," said the 45-year-old.